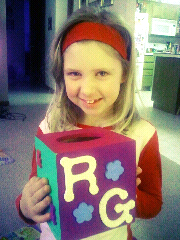 For the first time ever, we had to come up with our own Valentine’s Box for school. Prior years we just had to contribute a cereal box or something and the kids made it at school. But, this year, the options were wide open and we were able to come up with our own idea for a Valentine Box. What I really wanted to do was find a paper mache/cardboard type box that we could then mod-podge different Valentine related paper too and cut a hole in the top. We looked all over Michael’s and couldn’t find any that were the right size. Then in their wooden section, I saw this kleenex box and had an idea that it would work. Have you seen that section at Michael’s? Reagan wanted to buy one of everything just to paint them up. Guess I know what some future gift ideas could be now! So, I let Reagan pick the paint colors, (purple, pink, green and blue) and different wooden embellishments (teddy bears, flowers, and the letter R and G) and we finished it up yesterday. It turned out really cute and since her class only has 16 kids, I think it will fit all the valentine’s just fine. The best part is that it will be great for her to use in her bedroom after Valentine’s day and it matches her room colors already. She can use it for a kleenex box or to keep special things inside.